Self harm is the act of intentionally injuring yourself. This can be done in many ways for various reasons. But why would anyone do this to themselves? There are many reasons people feel the need to self harm, which often can't be understood by others. It's a very personal problem and is difficult to overcome, especially as self harm is so little understood. So how do you understand and help a self harmer? Knowing a little about the underlying psychological issues is a start. Self harm (or self injury as it is otherwise known) is by no means a recent problem. For hundreds, if not thousands of years it has been adopted as a method of atonement and punishment for a persons sins. In the history of religion self harm was commonly used as a way to become cleaner, purer and closer to God, dating back to ancient Maya civilisation in sacrificial rituals, and later on in Catholic self flagellation. In modern society self harm is most commonly recorded in young girls from the ages of 11 - 20, but it's also an issue for many men, older and even younger people. Cutting is the most used method, but by no means the only one. Burning, pinching, hair pulling, hitting and extreme exercise or dieting are also used by self harmers. These destructive behaviours are often seen as an attempt at attention seeking but this is usually not the case. Self harmers are generally very self conscious about their scars and wounds, and try to keep them hidden from everyone, including close friends and relatives. Although not everyone who suffers depression self harms, many people do have a higher risk of developing the self harm behaviour. During periods of extreme mental anguish, sufferers may cut themselves in an effort to release the emotional pain, or when feeling empty and numb, can hurt themselves in a desire to feel something, even if it is physical pain. When someone has such low self esteem that they begin to hate themselves, self harm is used to express their hatred for their body, and a punishment for their perceived failings. This often occurs when a person is being bullied or abused. When someone is suffering an emotional trauma or abuse, they can feel the need for a physical sign of their pain so someone will notice. They may feel scared to approach anyone about their issues, so this is their way of showing they need help. Unfortunately even when a self harmer wants someone to notice their pain, they can still feel the need to cover their injuries, making it hard to recognise the problem. It's a common misconception that self harm is a precursor to suicide. Actually people who self harm usually aren't planning to end their life, they're just using it to cope with their situation. While self harm isn't a helpful coping mechanism, it can provide a temporary relief which self harmers believe to be an improvement to their emotional state. The first thing you can do to help someone who is self harming is making sure they see a doctor. This absolutely must be the first step, as they will likely need counselling or other treatment. It's very difficult to stop this behaviour without medical intervention, as you can't just tell them to stop. Self harm is as compulsive as addiction, and sufferers will try to continue doing it after they've been found out, going to extreme lengths to avoid discovery. Have an open, honest discussion with the person, being sure not to show anger or disgust with them for doing this. Let them know that you're there to help and support them, but also that it hurts you to know they feel the need to do this to themselves. Self harmers often have a problem with seeing past their current problems, so try to point out that things will get better with time, and that self harm won't help them in the long run. Many psychiatrists suggest distraction techniques, such as writing down negative thoughts instead of acting upon them, engaging in exercise and using non destructive methods such as holding ice against the skin. Just remember, recovery isn't quick or easy, and the best thing you can do is be there for them while they're going through it. 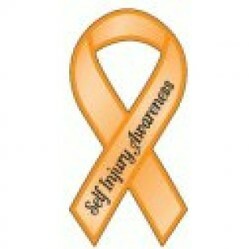 March the 1st is Self harm awareness day, where many people choose to be more open about their own self harm. A lot of people don't understand the reasoning behind self harm and pass it off as attention seeking, stupid behaviour. So the hope is that with enough awareness we can start talking about it. People are going through this every day without support, it's up to us to show that we care, the orange self harm awareness ribbon is a sign of hope and empathy - we can wear it to show sufferers that we're there for them. We understand, and will support them through the ups and downs of their recovery. It seems a lot of people see the evidence of self harm, but can't bring themselves to mention it. That's an understandable response as it's a hard issue to discuss. This is an excellent introduction to the topic. Didn't know about Self Harm Awareness Day. It's a good idea and should get more publicity, IMO.